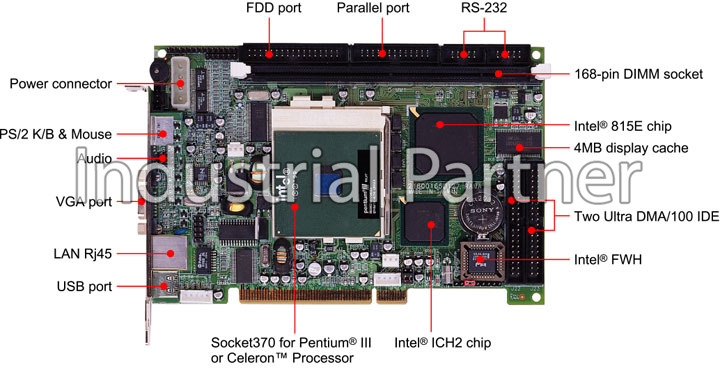 PORTWELL ROBO-616 is reliable design for high speed Intel Pentium III or Celeron processor. I has an Intel 815 chipset, backed up by Intel EID's long product life support. This single board computer has PC100/133HZ SDRAM for memory support, 4MB external display memory to enable optimum system memory utilization for maximum 2D/3D graphics performance through Direct AGP. The PORTWELL ROBO-616 has an on-board Intel 10BASE-T/100BASE-TX Fast Ethernet for high speed data transfers, an AUDIO Codec '97 (AC'97) 2.0 for a high quality audio architecture and a PCI bus interface for higher flexibility and expandability. Watchdog Timer: Programmable via software from 0.5 sec to 254.5min.